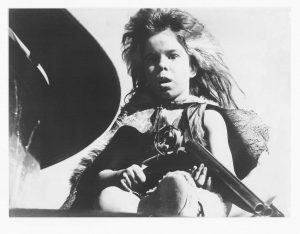 One of the most famous weapons in the Mad Max films. There were 3 made for production. The one that is seen in flight was wooden and covered in aluminum foil. A metal boomerang with holes in it was created to be used with wire special effects. 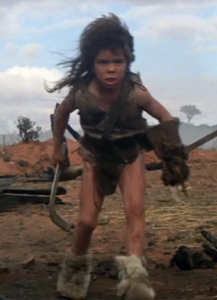 A third was the hero prop, which the Feral Kid carried. Hair was brown shoulder length with bleached blonde sections on both temples. The wig that Emil Minty wore started at the top of the head and ran down the back. It was woven in with his real hair. For Halloween, you could try a wig like this, with a colored hair spray to mimic the bleached hair. 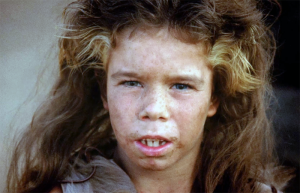 The Feral Kid has different-colored eyes. According to Emil Minty, they were green and blue contacts. 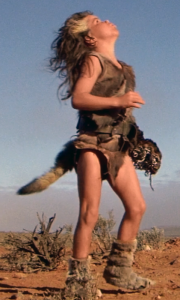 The main part of the outfit consisted of a shirt and loincloth. The shirt was a sleeveless V-neck shirt laced up the front, up the sides and at the shoulders. It’s unknown what kind of pelt was used. It may have been goat, since the hair seems a bit too long to be kangaroo, and too mangy and thin to be coyote. 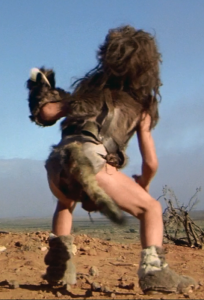 The bottom was a loincloth – like a skirt. Shorter on the sides, long flap on the front center. Some lacing possibly on the left side. The tail (which looks like a coyote tail) was on the back side. 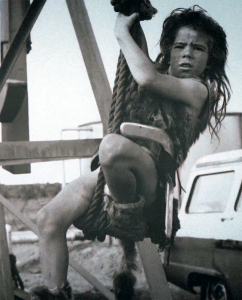 The Feral Kid wears a 2-inch (5 cm) wide brown leather belt held together by a brass slider. The slider is from a pattern 1908 or 1937 British L-strap (military webbing that was made of cotton). Buy an original L strap slider here for a limited time. On the back of the belt, a piece of brown leather the same width as the belt is riveted to the back to apparently serve as a holder for the boomerang (although the boomerang never appears in the holder). 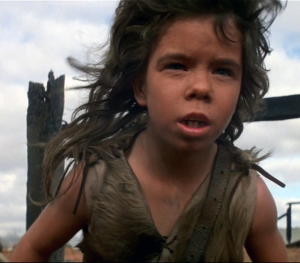 A brown shoulder strap with buckle holes in it runs diagonally from the belt across the Feral Kid’s left shoulder. 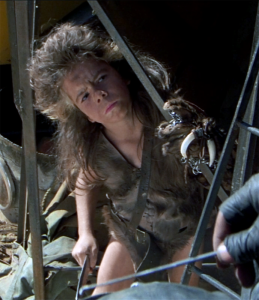 The Feral Kid is seen keeping the boomerang on his right hip at one point, and his glove is kept on the right hip after Max delivers the rig. Otherwise, he just holds onto the boomerang and has nothing on his belt. Short fur boots that cover the ankles. The fur appears to be sheepskin with natural and brown coloring. Some lacing is wrapped around the boots. According to Emil Minty, Ugg boots were used as a base for the fur boots, based on his suggestion. 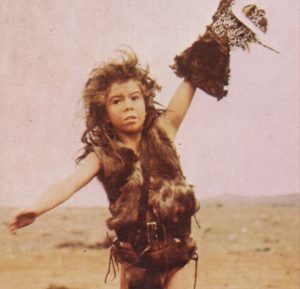 The Feral Kid carries an armored glove to catch his boomerang. 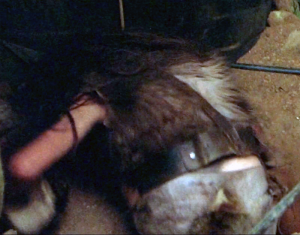 It appears to be a brown gauntlet glove with brown fur on it. Two white claws are dangling from the top. Chain mail rings are attached to the palm. 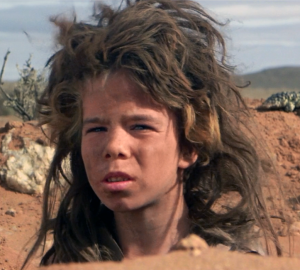 The Feral Kid wears a cape during night scenes, as well as the final chase scene. 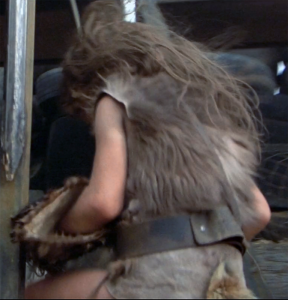 It appears to be made of the same type of hide as the rest of the costume, although missing more fur. Note the belt loop and strap. Note the loop on the belt, and the glove lining. Note the claws hanging from the glove. Here you can see that the loincloth is in fact separate from the shirt.